← Webkinz Ragdoll Cat Unboxing Video! 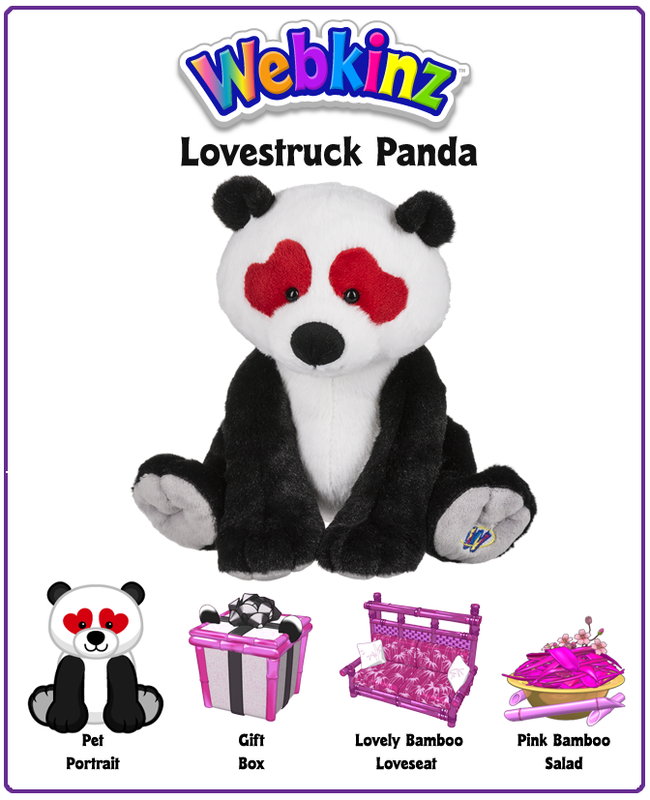 Webkinz Lovestruck Panda Unboxing Video! We gave you a sneak peek at this pet in an earlier Webkinz Newz story, and now we’d like to present to you our newest Webkinz plush pet, the Lovestruck Panda! Check out this unboxing video, revealing the Lovestruck Panda in action! If you’ve been looking for a cute and cuddly pet, we’re sure you’re going to absolutely adore the Lovestruck Panda! This big-hearted bear will wait patiently on their Lovely Bamboo Loveseat for you to come and play! And if they’re feeling hungry, they’ll just love to eat some Pink Bamboo Salad! Want a plush Lovestruck Panda all your own? This and other Webkinz plush pets are now available for order directly from the Ganz eStore! What would you name this sweet smitten pet? 12 Responses to Webkinz Lovestruck Panda Unboxing Video! Love the name Steve came up with. Love this pet. Hope it leads to a line of similar pets such as starstruck (or starry-eyed) raccoon and lightening struck ferret. Moonstruck and sunstruck pets could be done. Maybe a diamond-eyed dalmatian (diamatian?) with large diamonds around the eyes and small diamonds instead of spots. Since diamonds are white, you would need to reverse the colors and have a black body, but I think that would look awesome. And how about an apple-eyed horse (apple-oosa)? A green horse with red apples around the eyes and smaller apples on the flanks. Or it could have red and golden apples, one color on each and a mixture of both on the flanks. Daisies and clovers are also easily recognized and often used, but I can’t think of good names for these symbols They could be used on a cheetah or leopard, or a red panda. Maybe a lemur. Tuxedo, himalyan and siamese cats also have facial markings. Steve~ your Lovestruck Panda’s room is paw-sitively precious! Where did you get the bamboo in the north corner of the room, and the mauve-lous shower in the south corner? Great job designing with the new lovely bamboo loveseat! Pandora looks very comfy in her new digs! YAY YAY YAY we can get the plush pets from estore again – YAY Thanks for getting it fixed for us since I can’t find them at all in my area anymore and can only get the new ones here. Thank you. Just got them ordered. Me too! I live in Canada and I have a hard time finding the new pets anywhere! (I sometimes find older ones at loonie stores like Dollarama.) I just ordered both pet bundles and can’t wait for them to arrive!